After years of watching, waiting, and—well, whittling, I felled a significant tree on our homestead. The current wood lot, showing the broken stump and the partially trimmed upper log (Photo: Mark A. Zeiger). We’d dubbed the tree “the fat wood tree” because it broke a long time ago. It fell against nearby trees, hanging up in their branches. Where the tree broke, sap oozed out to mend the break. The tree died, and it began to dry. 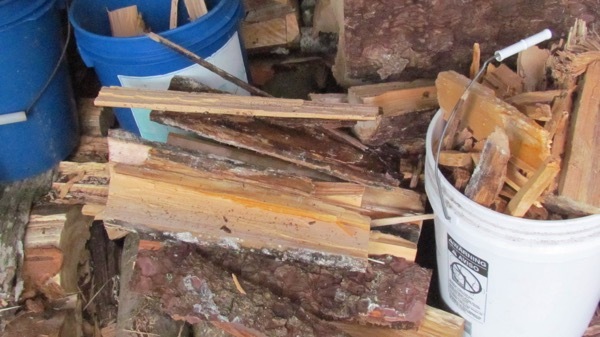 The splintered break formed fat wood, excellent for starting fires. We left the tree alone mostly, because of its proximity to an eagle nesting tree. That gave it special status, restricting human activity near the nest. It’s even marked on our plat. It was also abandoned by eagles years before we ever bought the property. When we first saw the eagle’s nest in the tree, it had 3-foot high currant bushes growing out of it. Now, I’m not even sure the abandon nest still exists. Eagles still fish from trees in the area, but generally ignore that particular tree! The fat wood tree lies in the restricted area, though, and we’ve never learned how to “decommission” an abandoned eagle tree. We largely kept away from the tree, other than to break off some of the fat wood now and then. Eventually, Michelle read up on the eagle nest restrictions. 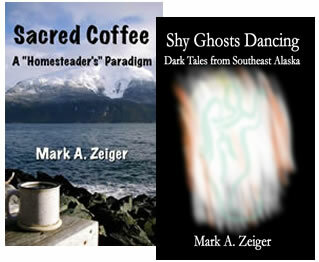 They aren’t as bad as I’d previously read (they may have been deregulated since I first looked?) 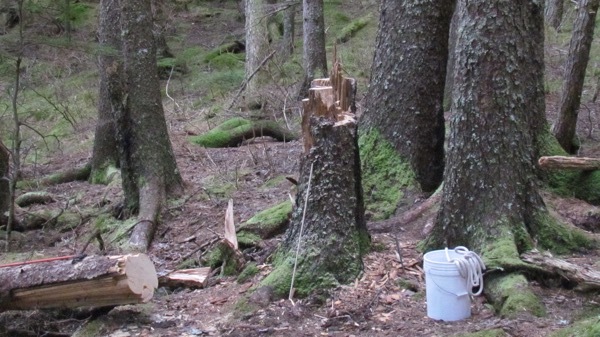 and we discovered that we could cut the fat wood tree as long as we did it outside of the eagle nesting season. I started cutting earlier this winter, working around the break to whittle away at it. Eventually, it remained standing only by a segment of trunk that was about 6 inches wide and an inch thick! I apologize that I never took a photo of this. Goodness knows I had plenty of time to do that before it fell! I’ve observed elsewhere on the blog that trees seem perfectly balanced to stay vertical in horrible conditions. This tree, so close to falling down, lasted through 50 knot winds ( 57+ m.p.h.) from north and south! I warned the family away from it, and approached it only with the most extreme care. Monday, I finally brought it down. I used a pocket chain saw with a long loop of line attached to each end, so I could saw from a safe distance. I cut through the remaining wood until the blade jammed in the kerf, then I stuck a long, small-diameter log into the remaining space, and pried against it. When the tree fell, it fell well! 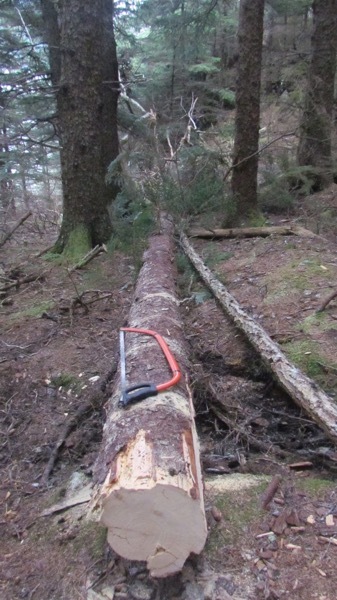 Unlike most of my felling jobs, it didn’t hang up elsewhere in the surrounding trees, it smashed through the surrounding branches clear to the forest floor, taking several smaller trees with it. I’d counted on this happening for a long time. I didn’t worry too much about cutting new firewood this winter, as I assumed this one tree would finish out our winter heat needs when it finally fell, and give us a generous start on the next season. Now that it’s on the ground, that seems quite likely. I’ve got a lot of bucking ahead of me, though, starting with the fat wood section. It’s so richly pitched, I won’t bring it into the cabin until it’s time to put it right into the wood stove—we don’t want the sap warming up and running all over the wood box.